Well, I was researching my family history and I discovered an unknown daughter of my 3rd great-grandfather, William Deininger Sr. He was my maternal grandmother’s great-grandfather. I was searching for Deininger information on FamilySearch.org – trying to figure out if there were any other Deiningers in the Jo Daviess county, Illinois, area between 1850-1900. Thought it would be a dead-end. I was wrong. I certainly was not expecting to find a daughter. It started with a name – Magdalena “Lena” Deininger. I found her marriage record, her death record naming a William Diniger as her father. I couldn’t quite believe that she could be “my” William’s daughter. His biography was published in 1889, with no mention of this daughter. I wondered if she could be the daughter of a brother. This made more sense to me than a daughter no one in the family knew anything about. But I needed to find proof and then I remembered to check William’s will. And there it was, written confirmation of this daughter. Georg Wilhelm Deininger (aka William Sr) and Rosina Dorothea Reber had a daughter Rosina Magdalena “Lena” Deininger, born 19 Aug 1845 in Blindheim, Germany, and christened 22 Aug 1845 at Evangelisch, Bubenorbis, Jagstkreis, Wuerttemberg. At this time, no marriage record for William and Rosina Dorothea has been found. William immigrated to the United States in 05 May 1853. It is unknown who cared for Lena during this time. He married Rosina Heffner in Pennsylvania on 22 May 1853. 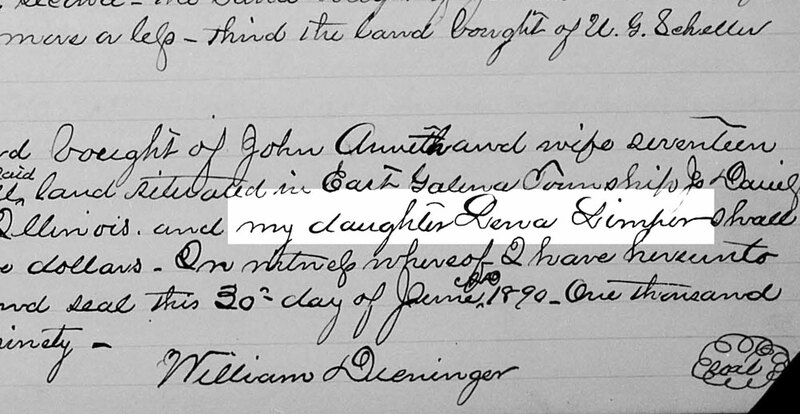 At age 13, Lena immigrated to the United States in May 1858. By the time of her arrival, William and Rosina had settled in Galena and were raising three children: Barbara, John and Mary. On 20 Jun 1865, Lena married Charles Limper in Jo Daviess County. Charles was born 10 Jul 1827 in Germany. He was 18 years older than his wife. They had six children; five have been identified: Anna, Carl, Pauline, Louisa and Sophia. On 26 Apr 1900, Catherina (Knapp) Deininger, widow of Michael Deininger and sister-in-law of William, died leaving a significant portion of her estate to Charles. Charles died 17 Sep 1904 and Lena passed 08 Jun 1931. Both died in Galena and with burial in Greenwood Cemetery, near Michael and Catherina Deininger.